Online ticket sales for this event are now closed, but tickets will be available on the door. Cash appreciated; our card line is currently being worked on by BT! One hundred years ago, English folksong collectors Cecil Sharp and Maud Karpeles travelled to the Appalachian Mountains in search of old ballads, and struck gold. In this acclaimed presentation, Brian Peters tells the story of their epic quest through slides, narrative and a selection of the best songs and tunes, accompanying himself on guitar, banjo and fiddle. 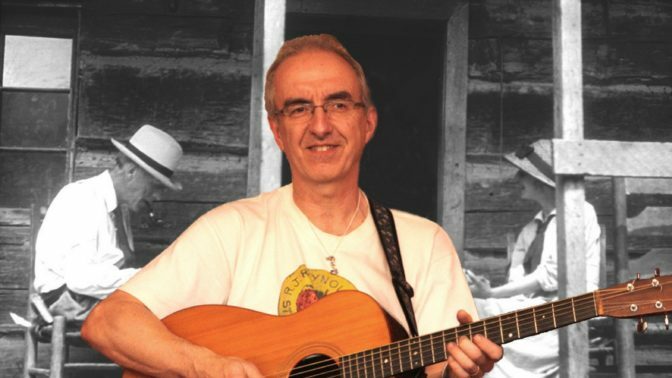 Sharp’s Appalachian Harvest is devoted to the astounding collection of songs made by Cecil Sharp and Maud Karpeles over three summers in 1916, 1917 and 1918. The English songhunters ventured into the heart of the mountains battling hostile terrain, sickness and personal discomfort, to seek out old British ballads still being sung in remote mountain settlements by descendents of 18th century migrants. They amassed a collection of over sixteen hundred pieces: one of the greatest folk song collections ever made. In the show Brian performs some of the brightest gems from Sharp’s manuscripts, accompanied by readings from his diaries describing vividly the hardships and triumphs of song collecting, a display of his wonderfully evocative photographs of the singers and of mountain life, and one or two rare archive recordings. The music ranges from ancient ballads to American breakdowns, dance tunes, children’s songs and gospel. Sharp’s Appalachian Harvest has been performed at British folk music festivals including Sidmouth Folk Week, Whitby Folk Week, Gainsborough Old-Time Music Festival, Cheltenham Folk Festival, and Derby Folk Festival, arts centres including The Sage, Gateshead, and England’s Folk Song headquaters, Cecil Sharp House in London. In the USA Brian has presented it at Old Songs Festival New York, at the prestigious Appalachian summer school in Swannanoa, North Carolina, and at the heart of US culture, the American Folklife Center at the Library of Congress in Washington DC. Brian Peters is a leading solo performer of English traditional songs and music, a powerful singer and an excellent musician with mastery of several instruments. Brian has played most of the major UK folk festivals, from Sidmouth to Celtic Connections, and has a strong reputation in North America, where he has tutored at Song Schools including Swanannoa and Augusta in the Appalachians, played many US festivals and concerts, and was the subject of a feature in the 2012 issue of ‘Sing Out!’ magazine.